The state of Virginia has declared a State of Emergency due to the expected winter storm projected by the National Weather Service. As a result, the state of Virginia has issued a waiver for carriers transporting emergency relief supplies. Such emergency relief supplies include livestock or poultry, feed or other critical supplies for livestock or poultry, heating oil, motor fuels, and propane, or vehicles providing restoration of utilities such as electricity, gas, phone, water, wastewater, and cable. 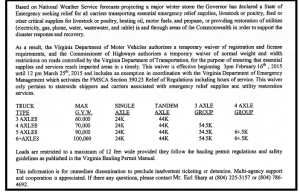 The temporary waiver relieves such emergency supply vehicles of registration and license requirements and also, a temporary waiver of normal weight and width restrictions on roads controlled by the Virginia Department of Transportation. Relief is being granted in an effort to ensure all essential supplies and services reach expected affected areas in a timely manner. Waiver is effective beginning 3 p.m. February 16th, 2015 through 12 p.m. March 25th 2015.